After you’ve created a sidebar, configured its options and added some widgets, it’s time to display it on the site. User is logged into the admin panel as an Editor or higher. Click Update. That’s it, the sidebar will now be displayed on the page! 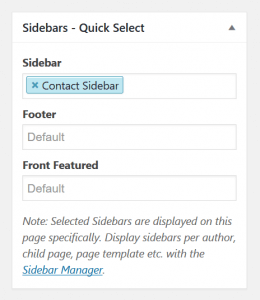 In the example image, the user has selected the Contact Sidebar to replace Sidebar on the Contact page. Good to know: This option is visible for any public Custom Post Type on your site! Note: Special pages such as Blog or Front page are not available with Quick Select. User is logged into the admin panel as an Admin. That’s it, the sidebar will now be displayed on the Blog page and all single posts! Good to know: Display Conditions are saved automatically on change! Target content in a specific state, such as all single posts, post archives (Blog), or both. Display the sidebar on all content but the selected. If a page, category, or other hierarchical item has been added as a condition, any future children/sub-items will be added as conditions as well.